Ghost hunters come from many diversified backgrounds, as you know some are plumbers turned TV Stars other come from all walks of life. Even TNA wrestler CM Punk tried his hand at it during Scifi's Ghost Hunters Visit to The Stanley Hotel. The search for the unknown and life after death seems to be always a never ending trek. Ghost tours seem to be a great place to start in any city across the United States. Many Ghost Tours often provide the history and location of reported hauntings. This by all means is the safest way to start. After the tour always ask questions of the tour guides and others on the tour ask them did they see anything or feel anything. You might just be very surprised at what answers you get. Look for paranormal groups in your area. If there are none start one. Buy some books and try to reach groups near your city or area for a pointer or tips on how to start one. Is there really such a thing as a paranormal experts in this haunted world? When all else fails they say call in the experts. If your haunting has gone all out of control or you need some serious validation to the strange supernatural or paranormal occurrences that are happening to you then seeking expert help is your only solution. Published authors, lecturers, radio and television hosts, and more are all considered part of the ever growing field of research. 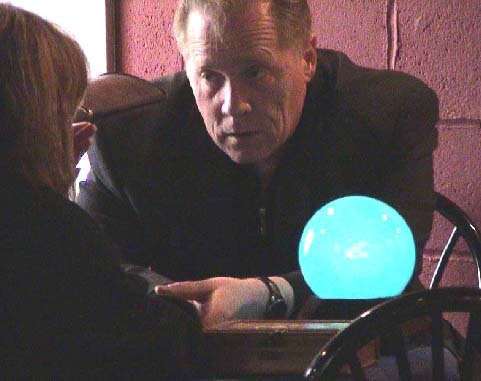 Some do not claim to be experts in the paranormal, as no experts really exist when it comes to the supernatural, It's all just gathering information and experience things on a first hand basis. Different places often have different rules. Never trespass or just go out to a reported or suspected haunted location by yourself or unannounced. Never go with people just for fun or on a lark. And make sure that people you go with are not anything but serious. These Seven Simple Steps To Becoming A Ghost hunter/Paranormal Investigator have helped many that I let tag along with me, I hope it is a help to you and getting your ghost hunting, chasing, or paranormal Investigation under way. Remember research is the key to your first steps. And of course contacting the owners of properties and local authorities can save you a lot of headaches and problems also. Always research for a ghost hunt. Even if taken a ghost tour is the way to discover more about your cities history and possible other sites for hauntings not on the tour. Buy books on ghost hunting and on your areas history. Research things to the max. Never just go by a persons word. experience and first hand investigating is the key. Her are just a few of the best out there today in the way of ghost hunting books. How to hunt for ghosts the safe way: Safety tips from different ghost hunter groups, web sites and authors and paranormal investigators. Everyone needs rules and guidelines to follow, Ghost Hunters too. Everyone knows "Don't ever investigate alone". Safety in numbers. But is there more? Some Groups and individuals may disagree on how to search for ghost. Yet all agree safety first. While this certainly isn't a complete course in paranormal investigation, it will give you a good idea of how to approach the subject. Two of the most important things to remember are safety and the law. What tools do you need to have on ghost hunts? An ancient ghost detection device." Essentially, it's feathers in a box, the purpose of the box being to prevent a breeze from moving the feathers. If the feathers are moved then you know you have a ghost in your midst. Many of the items listed can be bought in our ghost hunting equipment store. >Please visit it here< BUY: Ghost Hunting Equipment ON LINE Store. In 2005 GhostRadar was launched and claims to be very accurate. It uses the body’s chemicals and senses to detect ghosts. Modern day ghost hunting is a gadget packed hobby that often costs the enthusiast thousands of dollars. No self respecting ghost hunter is without an EMF Detector which identifies static electricity, the alleged causes of ghostly manifestations. Another piece of equipment is the digital thermometer, used to detect fluctuations in temperature in a location. Just before ghost activity there are sharp, unexplained drops in temperature so an accurate thermometer is important. A ghost hunter will also carry sound, humidity and light meters to monitor the location during their investigations. Good recording equipment is essential, so tape recorders and Dictaphones should be used. The higher the quality of equipment the better the chance that of future analysis of any evidence recorded. Most researchers use infrared cameras during their investigations. These are particularly good for picking up mists and light anomalies. High-end equipment such as radiation detectors and thermocameras can also be purchased but could cost huge amounts of money. The famous ghost hunter Peter Greenwood once commented that he had seen ghost hunters with cars full of equipment and yet it is the man with just a tape recorder that gets the evidence. You can document and detect ghosts and spirits with a variety of items. Of course the more you have the better, but everyone needs to start somewhere. Here are a few of what should be on top of your haunted Christmas, birthday or anytime of the year Wish List! The following are must have items. All inexpensive and all should be part of your ghost hunting pack. Colleagues: Don't ever investigate alone. Safety in numbers. Baby powder: We call this the drug-store motion detector. Its rare, but it can be sprinkled and used in rooms to record footprints or movement. Flashlights: Strong versions with clips that can be attached to your clothing are the best. And remember, bring several. Some may fail. You can also mute strong lights when you need less light by using thin fabric or colored cling wrap. Candles: Can all your batteries fail? Oh yeah! You can also use smoke in air tight rooms to record odd air movements. Batteries: As previously mentioned, batteries tend to drain. So take as many as you can. Chalk: Mark evidence and also mark trees and other areas where you might have ventured to help get back. If you are exploring, never contaminate an area with a mark that can't be later removed. If you have to permanently document it, take a picture. Watches: Record when events happen and coordinate your efforts. Suggest you have two: one wind-up type and one battery powered. Notebook: Make sure you have organized notes and bring a cheap book light so you can write easily. Cell phone: If you are in any remote area, make sure to have an emergency link to home. Also, make sure that someone knows where you have gone and when you will return for your safety (although you should never hunt alone). Thermometer: Ideally you would like to buy a very quick digital outdoor detector so you can find cold spots as they happen. Normal thermometer are too slow and won't produce any results. Tissue paper: If you are in a room that you know has no drafts, you can detect paranormal movement by suspending tissue paper or very thin cloth in air tight areas. You can even very the thickness in areas as a test in itself. Arrive early with your necessary ghost hunting equipment and give yourself plenty of time to set everything up. Here is a quick list of some equipment you may wish to use: a video camera, EMF detectors, 35 mm cameras loaded with brand new film and thermometers. Always remember to bring along plenty of flashlights. Don't forget to bring along some patience. Conducting a ghost hunt is a lot like fishing. You have to use patience. Start by selecting a private room or a general location for a main base of operations. This base is where all monitoring should be done. It should not be an area where ghost activity is high. After the base has been selected, do a complete walk through of the general area. Check out every room, and in graveyards, walk around the tombstones in a 50-yard radius. Videotape the walk through if you are using video cameras. Make sure that you know the layout before you begin the ghost hunt. Get used to the location. The ghost hunt will go much better if everyone feels comfortable with the surroundings. Use the EMF detectors to search for anything out of the ordinary. If you do pick up EMF distortions or if you feel that there is an unearthly presence nearby, take more photos. Just be aware that in cemeteries smooth glossy tombstone faces will reflect light from the flashlights or the camera flash that could create strange light patterns in the pictures. Glass objects and mirrors will reflect light inside houses. During the initial walk through or at any other time during the ghost hunt, try not to unnecessarily touch or move objects. You should leave the natural environment alone. As you are doing the walk through in haunted houses, hang up ghost catchers in doorways, between rooms, or on staircases. If a ghost passes near the ghost catcher, they will chime alerting anyone nearby. A lightweight wind chime will suffice. If there are objects or pieces of furniture that have been reported to move, put a chalk line or sticker on the floor next to these objects. That way, if the objects happen to move, you have a marker to judge and measure the exact distance. Everyone participating in a ghost hunt should always know where everyone else is to avoid confusion and misinterpretations. Sometimes handheld or headset radio communicators are good devices to stay in contact with the other ghost hunting members. Always log every event that seems out of the ordinary, (doors that lock, electrical problems, swaying chandeliers, strange lights, etc). Videotape everything for proof. You can attach glow-in-the-dark or reflective tape to objects to help you with the layout and to mark special locations. The tape will make it much easier to see dangerous objects in the dark. You don't need to turn off the lights inside of the haunted house to have ghosts appear unless it is vital to the appearance of that particular ghost. Even then, leave some lights on for personal safety. Always have a couple of mini spotlights ready for outside ghost hunts in case something happens and you need light fast. Do not be afraid to experiment on ghost hunts. Ask the ghosts to appear. Put the video cameras on different settings. Try the EVP audio taping methods. Use anything that you think might have an effect on the ghosts. If nothing seems to be happening, you might try to shake things up by playing religious or music that would be familiar to the ghost. On any ghost hunt, make sure to have packed plenty of snacks, drinks, and maybe a board game. Ghost hunts can be long and tedious. You may have to spend several weeks inside at a haunted location before you experience anything strange. Spectrophobia, The Real Fear Of Ghost! You are not the only one to suffer from this intense phobia. Most sufferers are surprised to learn that they are far from alone in this surprisingly common, although often unspoken, phobia. Yet if living things did not fear death, or evolve to best avoid death, then life would cease to exist. Paranormal associations, societies, investigators, Ghost Hunters, and other organizations internet links, listed by name state or geography. Recommended for adults age 18 years and older. Do you think your house is haunted or know of someone's home that is haunted? Would you like to have your questions answered about the Spirit realm? Find out about the Spirits of the dead or why paranormal events are happening to you. Learn about these things and more from certified ghost hunter Patti Starr. 3) A set of “Brass Dowsing Rods,” designed and balanced for ghost hunting by Patti Starr. 5) Investigative forms used to interview witnesses, record investigations, and to document usage of equipment. 7) Completed assignments and exam for Certification will result in receiving a diploma of graduation as “Certified Ghost Hunter”. If you see a real actual Ghost or have a encounter with any type paranormal activities, it's always important to write down all of the details as soon as possible, (while they, the real facts of the Ghost sighting are still actually very fresh in your mind). WATCH THE MOON YOU MIGHT JUST SEE A REAL GHOST. Look up at the moon, and here is what I try to remember in dealing with a hunting or investigating a ghost sighting, or strange paranormal phenomena. Many beginner or novice ghost hunters do not realize that documenting the moons position and time is an important part of a sighting and haunted investigation... If you see a sighting or have an experience remember the moon plays an important role in recreating the situation to witness a sighting once more. Many even well established investigators disregard the actual "Moon Phase" into their ghost haunting/paranormal Investigation, not realizing the importance this is to your ghost documentation. In a report I try to include time and the moons phase knowing full well what effects I have documented in my haunted hunting. I know the moon goes through astrological signs every two days and I also not that the moon moves 1 degree every two hours. Then I just do the astrological math and add that to my documenting. Moon tables can be found in most astrology texts. The Moon, in Astrology, is the ruler of Cancer. The Moon represents our deepest personal needs, our basic habits and reactions, and our unconscious . All posts and comments are owned by the poster. Haunted America Tours is not responsible for comments made by the poster. Nor is HAUNTEDAMERICATOURS.com responsible for the content of posted external internet sites. Please make sure all required fields are entered and the verification code is correct before continuing.